The views are commanding from nearly every corner of the estate, but our PENTHOUSE boasts vistas nearing 270 degrees. Face southeast (right) and capture a dawn like no other. As if announced by the roosters in the village below, the island of LOMBOK shines brightest at, or near dawn. The Bali Sea, or central Indian Ocean, mirrors the cloud formations, distant skies, and becomes a twinkling canvas of the days events, starting with the local fishermen, on their traditional JUKUNG, sailing out for the day's catch. By sunset, the northwest (left) views including Lipah Bay, with villagers settling into the twilight, distant mountainside homes sparking the dim hillsides with their lamps, and beachfront restaurants and warungs setting tables and lighting candles for tonight's guests. Sunset is all that remains of the day, but the day will not go quietly. . . . Taking rest behind majestic Mount Agung, the Amed sun says GOOD NIGHT, but with mighty reverence. Each sunset, as if it were to be Bali's last, celebrates the passing day and the arrival of tonight's moon. Our PENTHOUSE experience includes a four post, hand carved teak KING SIZED bed, sumptuous linens and pillows . . . .all fully cocooned within romantic MOSQUITO NETTING. The ample en suite is appointed with a double vanity, HIS and HER marble sinks, and an outdoor waterfall stone shower. Take breakfast on your private balcony before heading to the pool, or waste the entire day on your very own over sized day bed and drink in the fragrant East Bali breezes from your secluded over-sized shaded balcony. Our PENTHOUSE is fully air conditioned for you comfort, and sleeps up to two persons. Attached to the main house, but with completely private entrances, Villa Candi Matahari presents our "SUITES". Along with commanding views of the Bali Sea directly out your window, we provide closer access to the common areas; Main living room, Kitchen, and Pool Patio. Only slightly smaller than our PENTHOUSE, these rooms also are proud of their teak four post KING SIZED beds with MOSQUITO NETTING, bedside chaise lounge, fine local paintings, hand crafted statuary, and antique tapestry. En suite has an ample bathroom and OUTDOOR stone waterfall shower. Our SUITES are also fully air conditioned and sleeps up to two persons each. The owners have taken great care selecting the property's furnishings and décor. Every piece of hand crafted, teak furniture has been custom made for Villa Candi Matahari. Each carved stone statue, painting, and antique tapestry elected personally to reflect an appreciation of local artisanship and a decadent atmosphere. Designed by famed Indonesian architect, Ir. I Made Mas Swajaya, you'll find a brilliant mélange of Balinese architecture and the more modern adornments of European design. We have spared NO EXPENSE in making your visit with us as splendid as it can be. Closest to the ocean, and our largest rooms yet, our private villas are FREE STANDING, one bedroom units. Each with expansive private balconies, beautiful garden and ocean views, water features teaming with fish and, if you're lucky, blooming lotus flowers. Of course, you will still benefit from the massive four post bed, air conditioning, and surround mosquito netting. Our Private Villas are perfect for an extended stay, or a small family. Rent both villas and your kids are right next door. The en suites add one feature you won't find in the main house. In addition to your own private outdoor shower, each Private Villa has a lushly gardened outdoor space, just off the main bathroom, with a giant hand shaped BATH TUB. At Villa Candi Matahari, our Private Villas sleep up to two persons each. Mosaic stone floor outdoor showers, marble floors and walls, modern (western style) toilets and faucets, and lushly gardened outdoor spaces are just a few of the features you'll discover in every room's en suite. 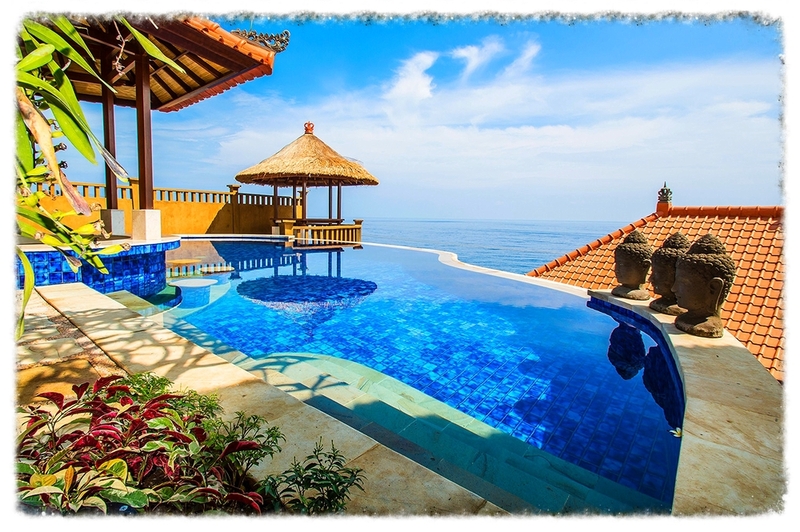 The indispensable elements of any tropical design must include it's OUTDOOR SPACES. 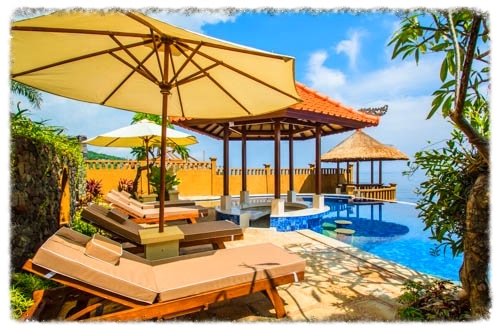 At Villa Candi Matahari, OUR outdoor spaces include a 10 seat outdoor dining pavilion, lush gardens with meandering stair cases and pathways, massage bungalow, all punctuated by our MASSIVE jewel toned infinity pool with SWIM UP POOL BAR. Take a long soak after breakfast, and you'll find that mornings turn to days, days turn to night. 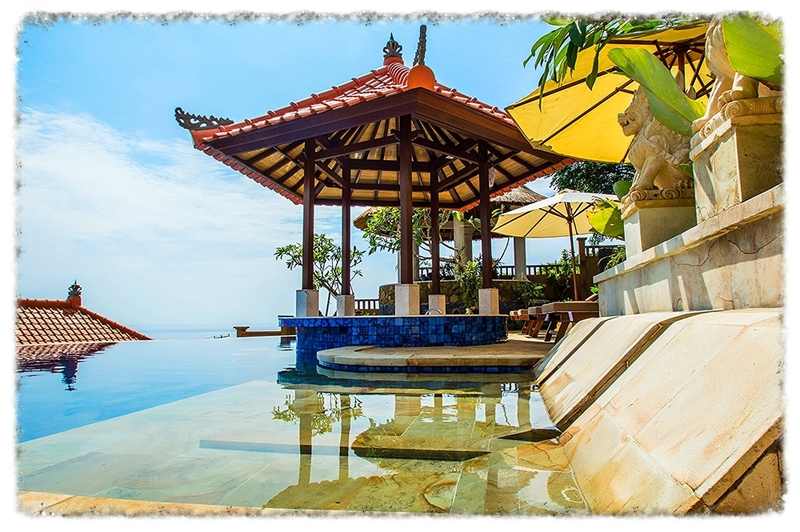 . . .each day, slipping by effortlessly, as our ALL BALINESE staff caters to your every need. A feature you won't soon forget. . . . our hand formed stone flooded pool lounger clique. Dragon statuary fountains cascade water on your sun drenched body as you gaze. . . .across the infinity pool. . . .endlessly over the Indian Ocean.